John Briscoe, the author of this very interesting guide to the history of the Californian wine industry, is not only a well-known author and poet but has also practiced law in San Francisco for over 45 years. He has called upon his comprehensive knowledge of San Francisco, living there, and serving on the board of three historical societies, and other organisations, to write this entertaining and informative book. 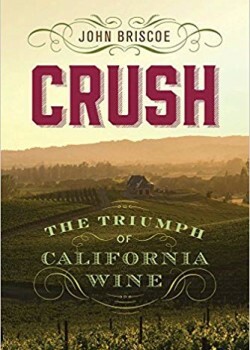 Throughout the book there are many examples of how the vintners were influenced and gained experience from the wine makers in Europe, and how California’s wonderful climate and soil attracted emigrant wine makers to the country. The sons of two such emigrants from Italy are the Gallo brothers, Ernest and Julio, who established their first winery at Modesto on 22nd September 1933. From there their business flourished and expanded, and today is recognised as one of the leading provider of wines in the world. Of course the industry has also had its fair share of disasters, and these are well chronicled too, giving the reader a rare insight into the incredible problems both natural and man-made which have arisen over the years. These have been many and varied, from the San Francisco earthquake, war, prohibition, and the dreaded tiny phylloxera (almost microscopic pale yellow sap-sucking insects, related to aphids, that feed on the roots and leaves of grapevines), which caused immense devastation to many vineyards, to the heated politics of the large vineyards and those who managed them.